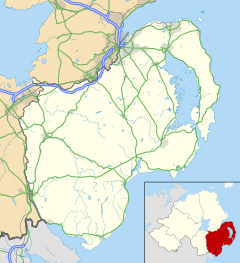 Drumaness (formerly Drumanessy; from Irish: Droim an Easa, meaning "ridge of the waterfall") is a village and townland (of 761 acres) in the Newry, Mourne and Down District Council area of County Down, Northern Ireland. It is 3 miles or 5 kilometres south of Ballynahinch, beside the main A24 Belfast to Newcastle road. It is situated in the civil parish of Magheradrool and the historic barony of Kinelarty. In the 2011 Census it had a population of 1,339 people. Drumaness developed as a mill village in 1850, with the opening of a spinning mill on the banks of the River Cumber. The village lost its employment role in 1968 following the closure of the mill and today it is largely a commuter settlement. It contains a limited range of services and shops. Christ The King Catholic Primary School and the Church of Christ the King are situated on the Drumsnade Road on the opposite side of the Newcastle Road, approximately a quarter or a mile or 0.5 kilometres south west of the village. The centre of the village has a distinctive appearance with listed terraces of mill buildings, alleyways, courtyards and a millpond. The Dan Rice Memorial Hall, now used as a community centre, is a listed building. Former world champion MMA Fighter Paul McVeigh started his martial arts with Down Community Jujitsu Clubs in Drumaness. Drumaness is in the Parish of Magheradroll. There is evidence of Gaelic football being played in the parish as far back as 1889 when a club was in existence in Glassdrummond, on the Belfast side of Ballynahinch. A club was formed in Ballynahinch in 1935 and continued until it moved to Drumaness in February 1957, where it has remained ever since. The Down All-Ireland-winning footballer Peter Withnell is a native of Drumaness. Drumaness Mills F.C. are a local football club playing in the NAFL Premier Division of the Northern Amateur Football League. Drumaness Cricket Club plays in the NCU Senior League. Drumaness GAA club has recently decided to bring back their Camogie club after closing it down following many years of running. Drumaness has a Catholic chapel called "Christ the King". Drumaness has one Catholic Primary School called 'Christ The King'. Amanda McKittrick Ros, the writer, was born in Drumaness (b. 1860 - d. 1939). ^ "Drumaness". IreAtlas Townlands Database. Retrieved 19 May 2015. Wikimedia Commons has media related to Drumaness. This page was last edited on 5 April 2019, at 19:54 (UTC).